The Chillibreeze Christmas Programme 2016 was met with much fanfare and anticipation all around the office despite the misgivings of the busy winter month. It promised to be a day of fun and frolic as the festivities kicked off with the mandatory photo session which was almost immediately followed by a power outage at the office! Notwithstanding this brief interrupt, Santa himself popped up on the big stage with his bag of goodies (despite demonetization) to give each team member a Christmas present and teach them the true meaning of the holiday season. 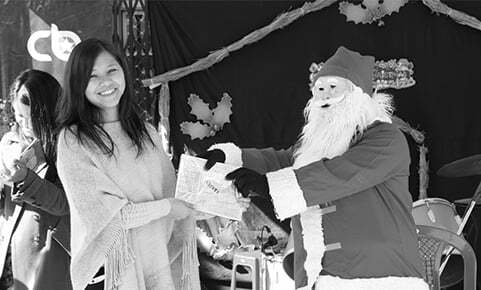 Marbahun receiving gift from Santa with a big smile! Pictionary–A classic sketching and guessing game. The organizers shook things up by introducing three topics; a quote, a song piece and a movie. Each team must select a sketcher and the rest of them had to guess out the name based on the sketcher’s doodle. Team members had fun racking their brains and putting their doodling skills to the test as they try to beat the one—minute clock. At the end of the round, the spoils were shared between The Winter Warriors and Santa’s Little Jumpers with two correct guesses each. 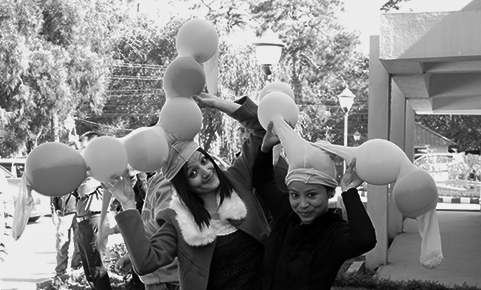 Reindeer Antlers–A humourous game which involved each team blowing 6 balloons, then stacking up the balloons inside a ladies’ stocking. The stocking, which at this point would be akin to a colorful antler was then supposed to be worn by a designated team member on his head–a complete reindeer! Teams must accomplish this in as little time as possible. The Winter Warriors bagged this game on their head (quite literally) with an impressive speed time of 58 seconds. Pass the Straw–A game which required significant team work; it involved the passing of drinking straws using a straw itself from one team mate to the other–through their mouths! Players line up on one end, a designated picker scoops up a straw from a bunch with his mouth and passes on to the team mate behind him, he in turn passes on to the next until the last person adds it to the team’s straw collection. This continues until two minutes have elapsed. The team with the most number of straw collected is adjudged the winner. Red Nose Reindeers pipped this game with an impressive tally of 8 straws collected. 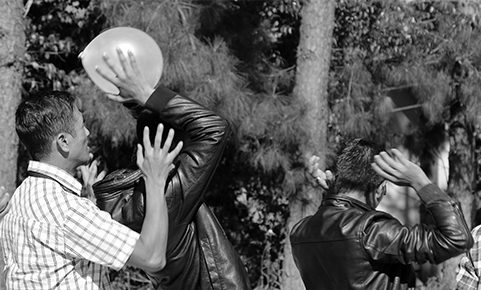 Pass the Balloon–Another team work game, players teamed up by lining along a straight line and passing a balloon; first over their heads to a team mate behind him or her then down below between their legs. The person who then receives the balloon on the frontline must then perform a ‘hop’ around a stool with the balloon still in between his legs. This goes on until all the players in the team had completed the ‘hop’. As is the case of Reindeer Antlers, the team who can accomplish this in the least amount of time was adjudged the winner. Once again, Red Nose Reindeers dominated the game with a time of 1 minute and 8 seconds. Owing to the tie in scores between Winter Warriors and Red Nose Reindeers, a game of Passing the Straw was played out again to break the tie and owing to the Red Nose Reindeers previous show of strength in this game, they proved their mettle by winning comprehensively—a total of 9 straws collected thereby proclaiming them the Champions of the Chillibreeze Christmas Programme, 2016. After the conclusion of the fun and games, a gift distribution ceremony was conducted by the Company to hand out gifts to all the team members as a token of good faith for the work they put in over the course of the year. The winner of the best room decoration was also adjudged and it was the Administration team who took the prize home for their décor work that they displayed in the kitchen. The IT Team and The Sales and Marketing along with Zizira Team bagged the 2nd and 3rd Prize respectively. 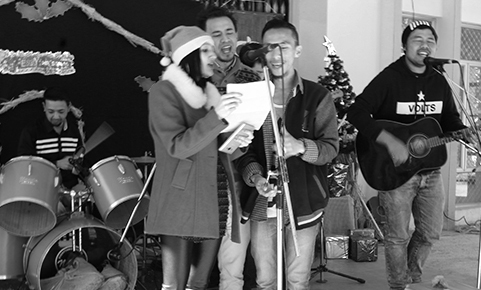 The gala was concluded off with Christmas carols from the Office band followed by a hearty lunch.